Attending a show at Green Hill Equestrian Center in Salem in the middle of July will make you appreciate trees and complain that no one ever thought of planting a few near the in-gate of the arenas. The sun was unrelenting at the Cross View Horse Show Series’ Luau show. A beach umbrella and a swimming pool would have been a very smart addition to every trailer. The to-be-expected July heat didn’t cool off the attendance on Saturday, July 14, 2018. In particular, the jumper classes were well attended with some classes in excess of 10 entries and the jumper division stretching until about 3 p.m.
As the over fences classes wrapped up in the afternoon, participation did seem to drop for the flat classes. Beginner walk and walk/trot classes — usually very popular — only had one entry. Meanwhile, the adult hunter pleasure classes, which are usually some of the smaller classes of the day, showed six riders competing. The Hunter Day of the Luau show was judged by Margaret Cornwell. Cornwell, a 2002 graduate of Ferrum College where she rode for the equestrian team in the open division, joined the Ferrum staff as the equestrian team coach in the fall of 2013. CLICK HERE FOR A PHOTO GALLERY FROM SATURDAY’S SHOW. Riders were also left fighting a common summer horse show curse: dusty arenas. While watering was planned by show management, their efforts were blocked by a broken water tank at the park show grounds. The second half of the show kicked off with a fun class for parents/spouses to get into the action: a leadline class all their own to help raise money for the Virginia Quarter Horse Association Queen. Spouses and parents will get another chance to show off some equestrian skills at tomorrow’s open class day in the Showmanship class just for them. The Cross View Horse Show appears to still be building momentum with each year in number of riders and quality of horses shown. The Luau show continues tomorrow with its open show featuring classes for English, Western and Hunt Seat riders. Leah Metz Hylton will judge. 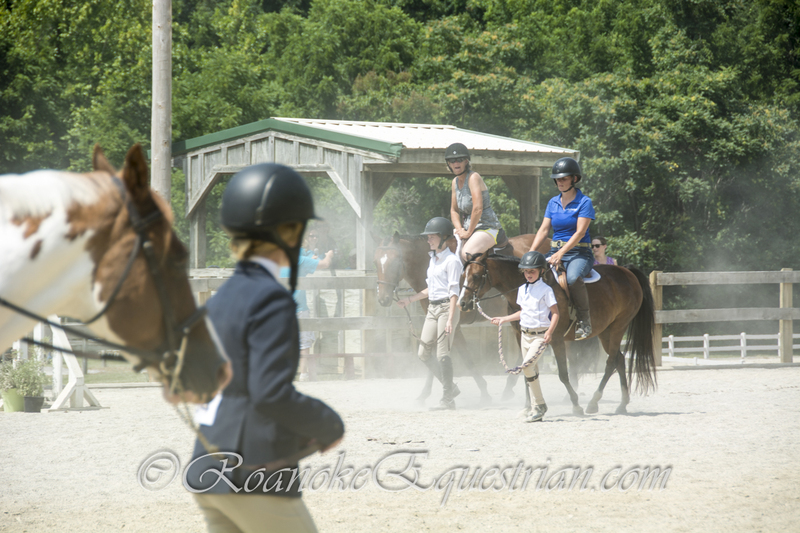 Posted on July 14, 2018 July 14, 2018 by RoanokeEquestrianPosted in Horse ShowsTagged Cross View Horse Show, Green Hill Park Equestrian Center, hunter/jumper, Margaret Cornwell.